Vera Heindel’s birthday party has become something of an occasion amongst Frankfurt’s clubbers over recent years. The Robert Johnson resident hosts her birthday at the club every year, as flocks of her loyal followers from the city flood the dancefloor year after year. Aside from the customary party bag filled with the inimitable blend of house and techno that has become associated with Vera, the guests are treated to a fun night of celebration with the crowds that have cheered her on throughout the years. We caught up with Vera before this year’s instalment (last Saturday) to find out about her birthdays past, present and future. Read on after the jump for part two of the interview: the aftermath. And be sure to come see Vera touch down in our Room One this Saturday to wish her a happy belated birthday. Tell us about your favourite birthday party? When I was a child I once disappeared from my own party and everybody was looking for me, until they found me sleeping, somewhere in my parents’ house. I guess that wasn’t my favourite one… In the past years, I guess my favourite one was the “Dance the Bus-Stop”-party two years ago, also at Robert Johnson. People had to learn a combination of dance steps at home, by watching an instructional video I made with friends (see video below) so we could all do this dance simultaneously in the club. It looked awesome to see everybody moving the same way, up and down… like a huge wave. I’d love to do that again. What are the essential ingredients to a birthday party? If I think about the birthday parties that I’ve been organizing, it has been essential to me to not only receive something from people but to give something back, something that people would remember. I always tried to make people participate by giving them a little homework before the party. This way, they would be excited even before the party started, and the curiosity and excitement would rise when they come to the club, where the single parts are being put together. Think for example about the dance that I talked about before. Or last year, the project I did with Patrick Raddatz, called “Music is…” (check it out here). People were asked what music means to them and record their definition of music on my answering machine. The answers were used for visuals in the club and printed to be used as wall decorations and the voice recordings were played in the live sets etc. I want people to realize that they are part of it, that they are creating the party, and that it’s not just about going to the club and consume (music, drinks, conversations, people etc.) or about which DJ is playing. It’s about being creative and being open. We all together create the special vibe of a party. Who would you invite to your fantasy birthday dinner party? How about a candle light dinner with Dracula… Or with Charlie Chaplin doing the bread roll dance for me? What would be the best present for you this year? A new pair of ears. Do you think the parties are going to get better with age? No, but I think aging is going to be easier with partying. Having found out what it is that makes birthdays so special for Vera, it was time to hit this year’s bash at the one and only, Robert Johnson in Frankfurt. 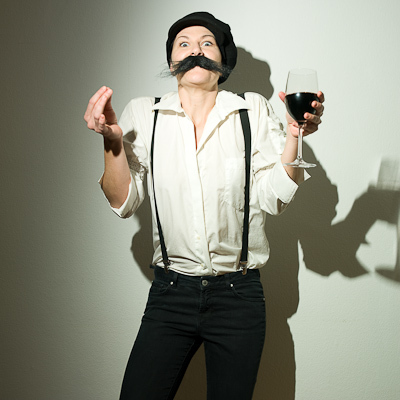 With no dance routines to rehearse this year, the party-goers were simply asked to wear a moustache and left up to their own devices (and Vera’s music of course) to have some fun. Like all parties at the city’s famous club, there was no disappointment. But don't just take it from us - let's check in with the birthday girl herself. Did you have a good birthday party? Tell us all about it? I had a lovely party. The crowd was really nice, and the whole night had a very good vibe. There were friends coming over from London, Italy and Spain and some of my oldest party friends that I haven’t seen in a long time. It was great to have them around. We installed a huge disco ball in the middle of the dance floor, and as Robert Johnson is pretty small and with low ceilings the disco ball took a lot of space on the dance floor. It was the centre piece of the party. Mark Broom played a lot of 80s and early 90s music, which perfectly matched with the decoration. And every once in a while we had those glittery confetti bombs exploding, which added on the disco-ish vibe. What was the craziest thing that happened on the night? Nothing particularly crazy. It was a good, solid party, not more, not less. Can’t really tell. For sure not me 'cause I never drink. Was the Robert Johnson the best place to hold your birthday party? Of course! Robert Johnson is always the best place to hold a party. Will you be treating your date at Fabric as your London birthday bash? Well, I hope a lot of friends from London, that couldn’t join the party in Frankfurt, will come over to party with me, so I guess it could become a second birthday bash. Should I bring my moustache?